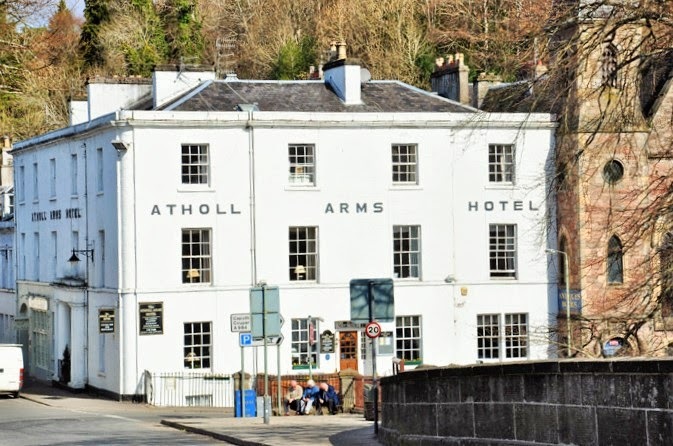 Last weekend, we made the trip up to Dunkeld for a fabulous couple of days at the Atholl Arms Hotel. Well, when I say made our way up, it sounds like quite a trip, but actually it's only a 40 minute drive from Dundee. We set off after Graham finished work, with the car loaded up with us, our bags, walking gear and one super excited puppy. Unfortunately I forgot my camera, so do excuse the slightly grainy phone photos. We were there in a flash. We parked and had a walk along the River Tay with Huxley to let him stretch his legs before we ventured into the hotel. You can see Cooper and Huxley having great fun in the gardens in front of the hotel. We were given a warm welcome in the hotel and shown to our room which was gorgeous. Tastefully decorated in a traditional style with modern twist, a theme which carried on through the whole hotel. Once settled into our room, we got Huxley snuggled into his bed for a nap, then we freshened up and changed for dinner. We decided to have dinner in the bistro instead of the restaurant as it was more informal, but spent a little time relaxing and having a look at the menu in the lounge first. I had a lovely chat with the owner Christine Sinclair over a glass of wine while Graham and Cooper did a spot of drawing. Christine is passionate about food and a vegan herself, so we had lots to chat about. She was really interested to hear what I thought about vegetarian and vegan dining in Scotland. We could have happily chatted all night, but the bistro was calling us, so we bid each other farewell. The hotel caters for everyone with it's menu, but the veggie and vegan dishes aren't a hastily added after thought, they are on a stand-alone exciting and regularly updated menu. Christine has a lot of input in the menu and I have to say I was really impressed by what was on offer. Graham and Cooper shared the foccacia and I had the roasted vegetable salad with puy lentils, red peppers and hummus. My mouth is watering just thinking about that starter, it was so full of flavour and the dressing was divine. Graham tucked into mine too! For main course Graham and Cooper had the haggis, but Cooper had chips with his instead of parsley mash and no sauce. Graham said it was the best meal he could ever remember having in a restaurant. I had the sweet potato dish. The contrast of the sweet and creamy texture of the potato against the spicy chickpeas and the fresh zingy pesto was wonderful and very, very filling. For dessert I had the white chocolate and coconut cheesecake with ice cream and rhubarb compote, which was really decadent. Cooper had chocolate ice cream and Graham had roasted baby pears with chocolate sauce. 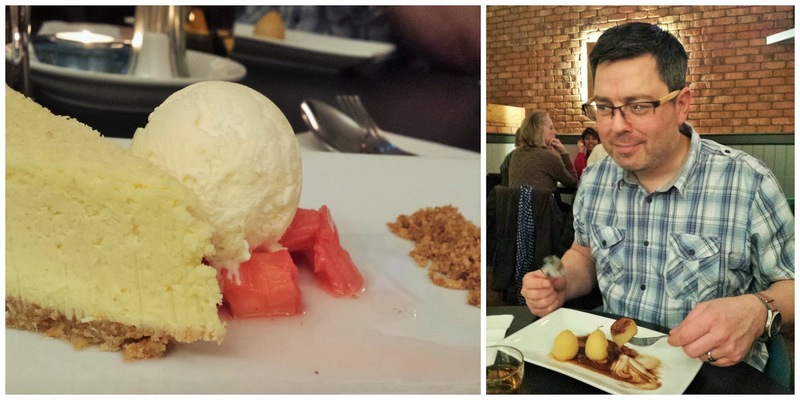 As a vegan Graham rarely gets a dessert when we dine out so this was a real treat for him. After dinner Graham gave Huxley dinner and took him out for a walk, while I got Cooper ready for bed and read him some bedtime stories. We all slept well and longer than usual, then headed down to breakfast in the restaurant where we had a full cooked breakfast including tattie scones and vegan sausages. Graham was given a choice of dairy free milks to drink and vegan margarine for his toast. We were very impressed. 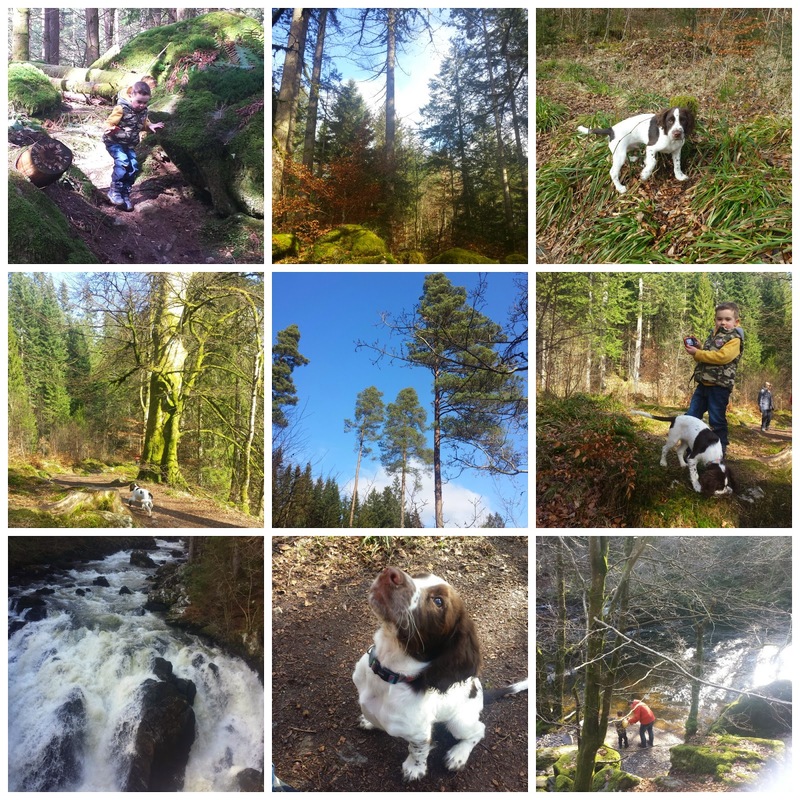 After we checked out and said our goodbyes we headed out of Dunkeld and did the Hermitage and Braan Walk to see the rather fabulous waterfalls. We give the hotel five stars and plan to head back there again for my birthday. I can see it becoming a regular haunt for us on special occasions or just weekends away and we'll definitely be doing the Hermitage walk again soon. Facebook, Twitter, Pinterest & Google+. 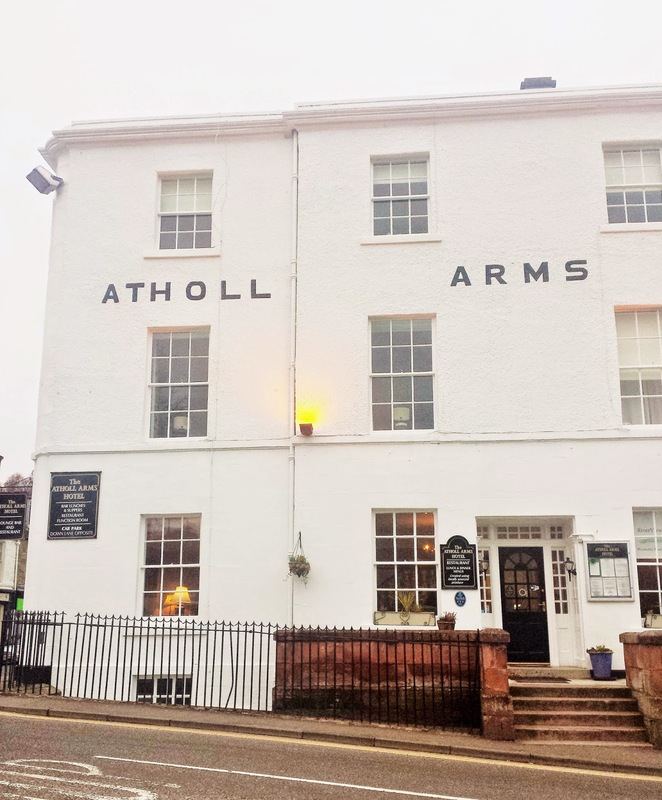 The Atholl Arms Hotel is Vegetarian Society approved and is a member of Eat Scotland and The Gourmet Society. They were awarded best in the region 2014 for Informal Dining from Scottish Hotel Awards and awarded best Seasonal and Local menu 2013 as well as Hospitality Gold Medals. Prices were correct at time of publishing this post. 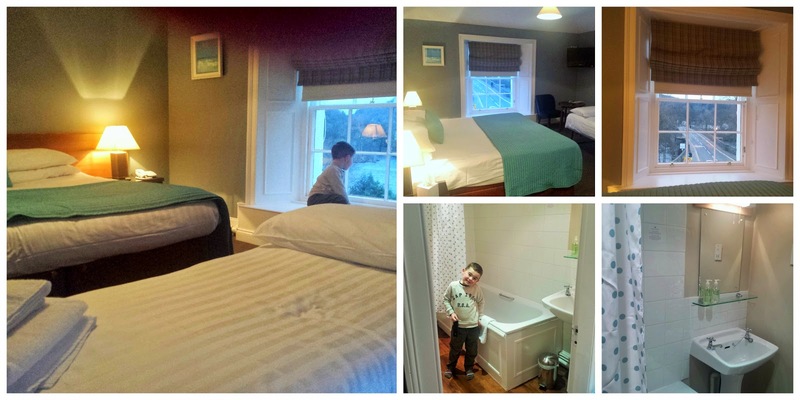 Disclosure: The Atholl Arms invited us to experience their hotel. I was not expected to write a positive review and any opinions expressed are my own. Thanks the food was amazing. You just can't capture how good it tasted in a photo. I agree re-Cooper, of course I'm biased. It looks like great place and I am impressed thats its veggie friendly. Should put this on to my to visit list. Maybe we could have a blogger meet-up there Nayna. Now that would be fun! Looks lovely must check it out! You should! We will be going back soon! Awww that's lovely that you were following it all on instagram and waiting for dessert. Did I not post dessert on Instagram? Maybe it was just Facebook! That does look good, and just perfect for you. I love the video of mad puppy and Cooper! Love the video of Cooper and the puppy! Looks like a really nice hotel and good to see such a diverse range of veggie/vegan options available. Thanks Jen, it's a gorgeous hotel and the food was fabulous! Well I will say nothing as I love both goats cheese and onion tarts, but I know what you mean. I wanted to try everything on the menu. Ooh, excitement! We have stayed here once and had lunch many times, but it looks as though there have been changes. I don't remember such a veggie-friendly menu or such smart bedrooms. Admittedly, it's been a while so we should definitely go back soon. Christine and her husband have done a lot of work on the hotel and menus Anabel and have won lots of awards and great reviews. You must go back and try again Anabel. Maybe have a wee overnight stay? what a lovely hotel. I remember seeing your food pics on instagram and it all looked fab! Looks like a lovely place to stay and excellent food too. It was Jan. One to remember if you head north. The hotel looked amazing from you Instagram posts but now I want to go even more. I've only ever stayed in Edinburgh and Glasgow so it would be nice to explore a new part of Scotland too (I live in Oxford). I'm glad the four of you had a great time! Another nice part of the country, I do like Oxford, but yes I would urge everyone to explore Scotland at some point. I know, it was perfect for us. Happy days! So this was why you were walking the Hermitage. :-) I have sent his hotel as I have stopped in Dunkeld many a time on the way up volunteer at The Maggies Monster Bike & Hike that starts in Fort William and ends in Inverness. We make a pitstop at Mhor Bread (or some such) but we have never stayed in Dunkeld itself. It is really good to know that there is a pleasant place to stay with such a vegetarian and vegan-friendly menu. I'm glad you all enjoyed your stay. Cooper and Huxley are such a cuties! 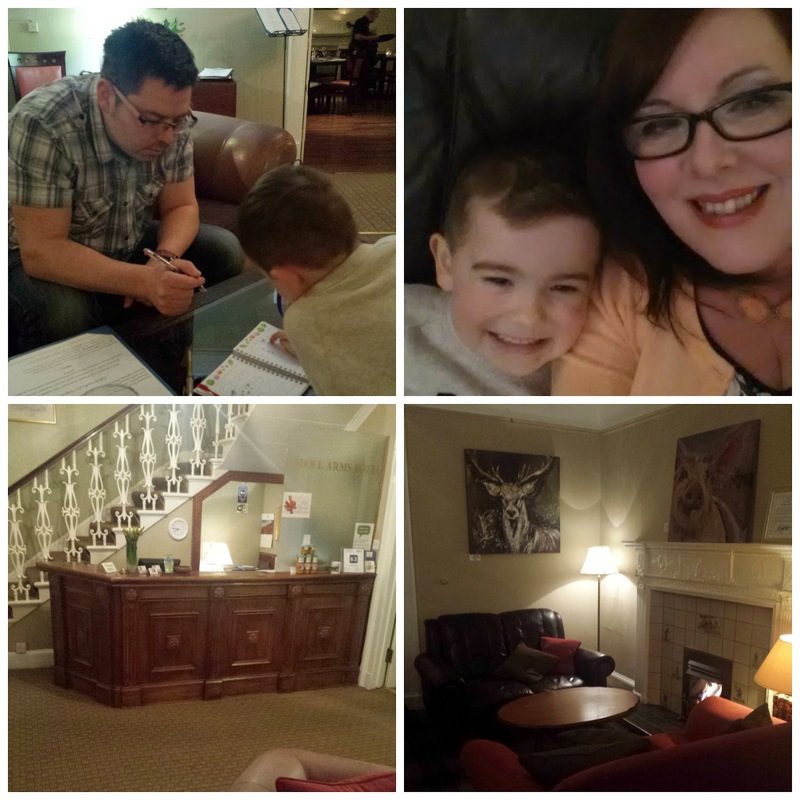 It is worth having a stay over Kellie, such a fab hotel. Ooh, those mocktails and the kale salad - yum. Dunkeld is lovely anyway - we always had such a nice time wandering the churchyards and climbing into a bell tower in a very, very old church - but we never thought to stay, and now I'm planning on this hotel with all the veggie options - fingers crossed, hopefully this year!! Oh I do hope you visit again Tanita. It would be so good to see you both again and yes you would love it at the Atholl Arms. Anytime you want him for a sleepover, just let me know Stuart. Although I warm you he's just as mad, but getting bigger. He's some dog! Sounds wonderful - a great break for you and a lovely place to stay and eat. Did huxley stay in the room? In my family as a kid our dogs always slept outside so I find the idea of having them in a hotel strange but I guess it keeps him calm to be with you. He did stay in the room Johanna, but we took his cage with his bed in it with us. It's really too cold most of the time in this country for dogs to sleep outdoors. He was very well behaved and enjoyed the walks. He was actually allowed down in the bar, but is still too excitable for that. That looks lovely. I was meant to go up for dinner but had to postpone. Hopefully will get up there soon.